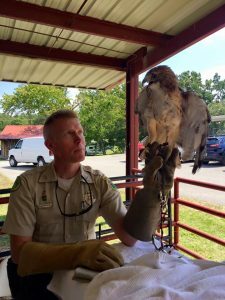 The Friends of Cumberland Mountain are taking donations to build two additional flight cages for Cumberland Mountain State Park’s educational raptors. The money raised will be used to build two additional flight cages for the parks new raptors to be on display at the park for visitors to see on a daily basis. Signage for each flight cage will be displayed to inform the park visitors the type of bird they are viewing along with other information about the bird. 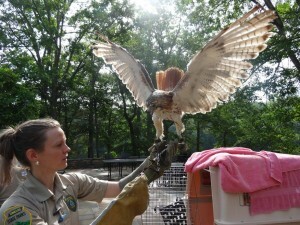 The additional cages will also allow our two birds that are fully-flighted to have an area large enough to exercise. The goal is to raise enough money to build two cages fully equip with electricity and water. We hope to achieve our goal as soon as possible so we can begin construction late spring 2019. Please join in our efforts to make the additions needed for our feathery friends! We will need volunteers to help construct the aviaries. Please email Park Ranger Monica Johnson if you are wanting to volunteer your time. 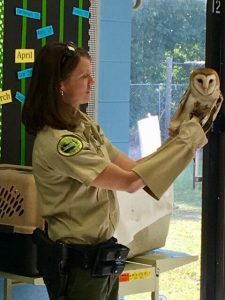 In 2014, the Birds of Prey Aviary was still a mere dream of Park Ranger Monica Johnson’s, one she had mentioned to several people over time. Sue Mathis, a local boy scout mother, approached Ranger Johnson at the park restaurant in the Spring of 2014, with a question, “Do you need help raising money for the aviary you talked about?” Ranger Johnson replied, “YES, how can you help?” Sue stated that her son would like to get involved with this project through his foundation, The Aden Foundation. From there the dream was on its way to becoming reality. Sue Mathis’s son, Aden, and the FCMSP worked closely with Ranger Johnson to set up fundraisers to start raising money to get the project off the ground. Local businesses, park advocates, and bird lovers graciously donated money to the project raising over $10,000. 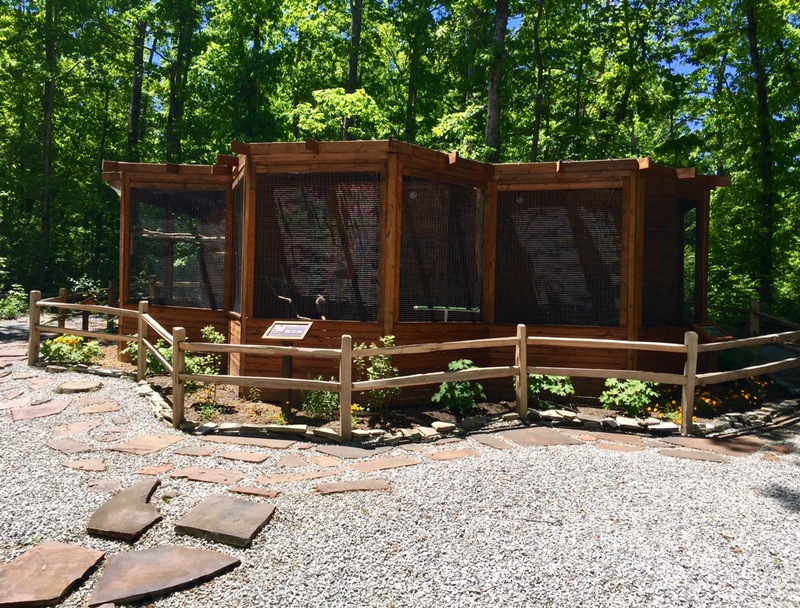 The first workday, October 18, 2014, twenty-five volunteers from the local community and surrounding counties came to lend a hand with the construction of the aviary, but only a handful of those dedicated volunteers would work until the project was finished a year later. The park had four workdays scheduled that Fall/Winter, but the project got put on hold late November due to a very harsh winter. Workdays for the project started up again in late Spring. The project was finally completed in October 2015. 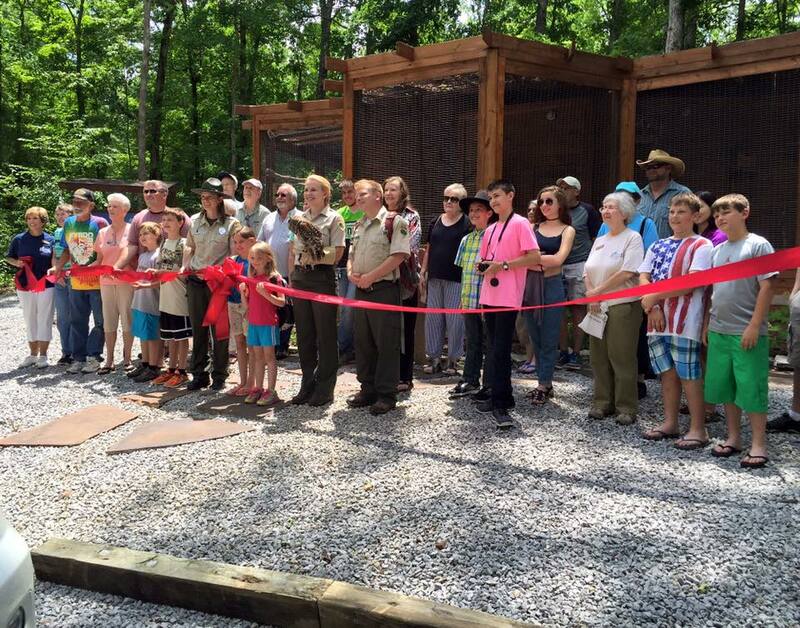 The park had an official ribbon cutting event on June 4, 2016. The Aviary is now open to the public. 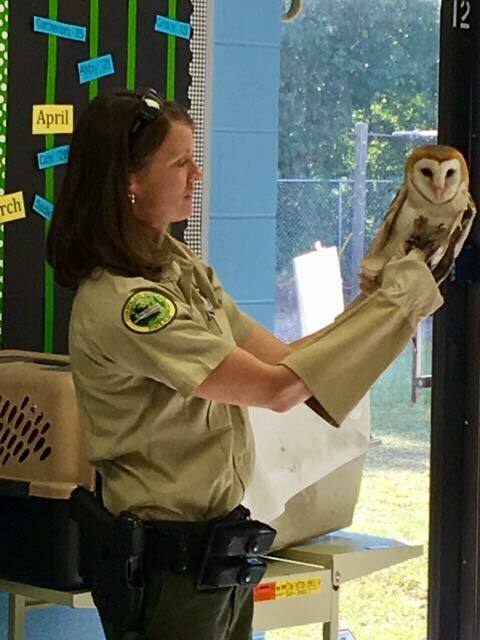 Please stop by and visit our feathery friends! 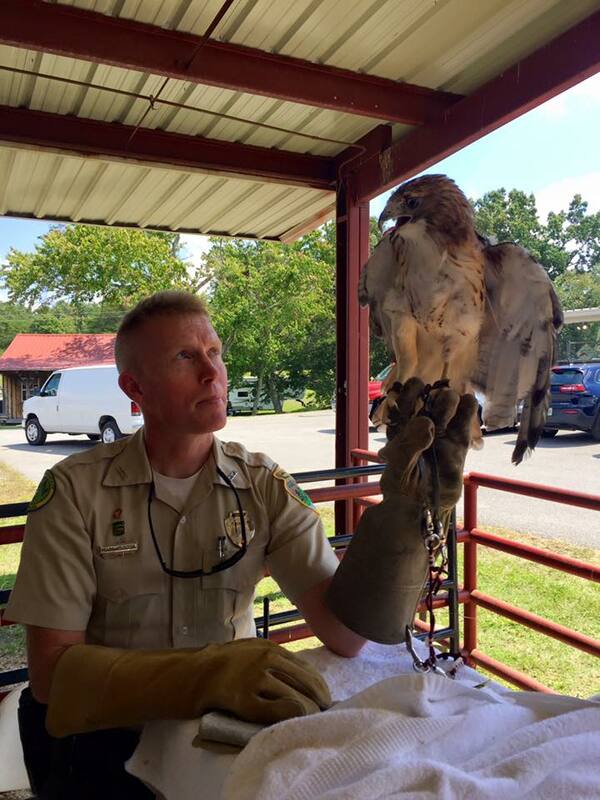 Cumberland Mountain and FCMSP are still accepting donations for the birds of prey program. 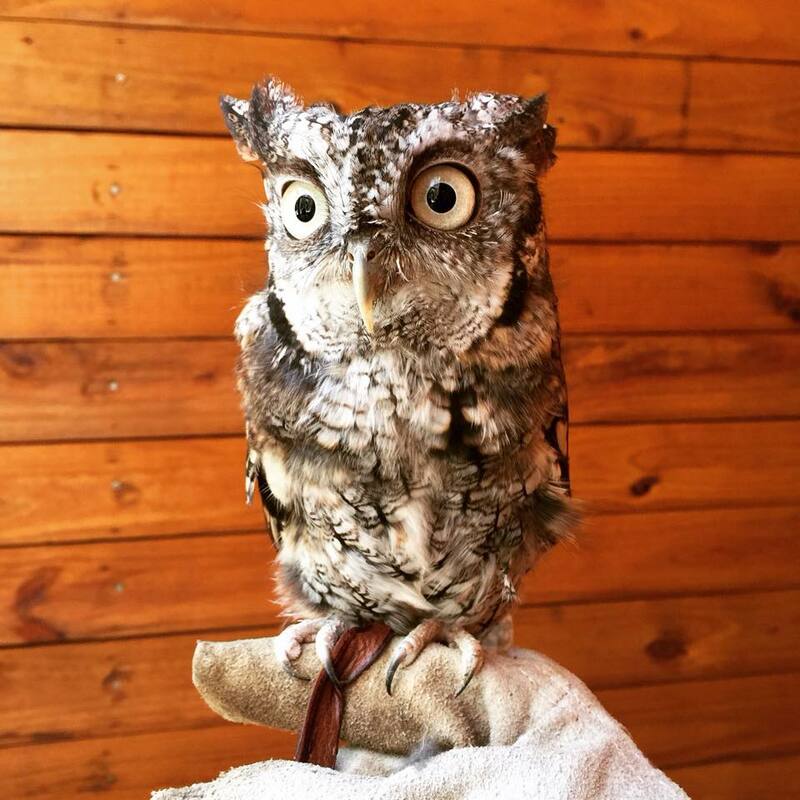 Donations are accepted at the aviary kiosk, camp store, and park office. Donations collected will go to purchase food for our feathered friends, as well as equipment we may need to care for the birds properly. To learn more about our feathery friends click on each bird of prey below. Courtship displays of male include bowing, raising wings, clicking bill. Male brings food to female. Mated pairs preen each other’s feathers, call in duet. Nest site is in cavity in tree, including natural hollows and abandoned woodpecker holes; will also use artificial nest boxes. Usually 10-30′ above ground, can be 5-80′ up. In courtship, male and female soar in high circles, with shrill cries. Male may fly high and then dive repeatedly in spectacular maneuvers; may catch prey and pass it to female in flight. Nest site is variable. Usually in tree, up to 120′ above ground; nest tree often taller than surrounding trees. Also nests on cliff ledges, among arms of giant cactus, or on artificial structures such as towers or buildings. Nest (built by both sexes) a bulky bowl of sticks, lined with finer materials, often with leafy green branches added. Still widespread and common, although may have declined in parts of south with loss of swamp habitat. 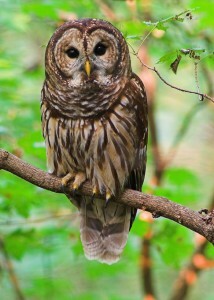 In recent decades, has expanded range in northwest, and is now competing there with Spotted Owl. Woodlands, wooded river bottoms, wooded swamps. Favors mostly dense and thick woods with only scattered clearings, especially in low-lying and swampy areas. Most common in deciduous or mixed woods in southeast, but in north and northwest may be found in mature coniferous trees. 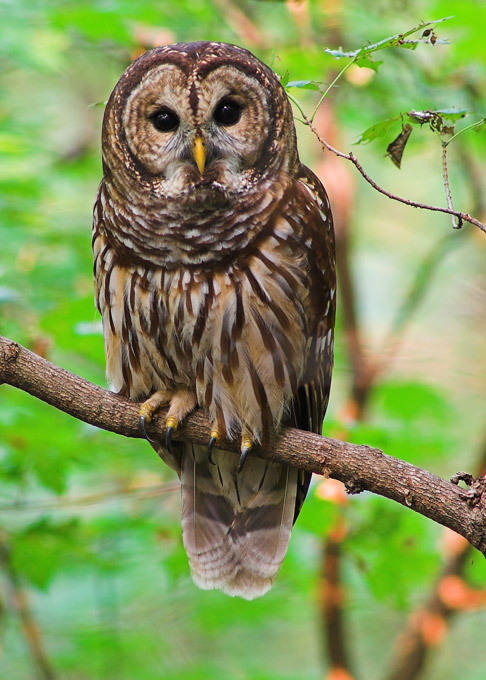 The rich baritone hooting of the Barred Owl is a characteristic sound in southern swamps, where members of a pair often will call back and forth to each other. Although the bird is mostly active at night, it will also call and in the daytime. 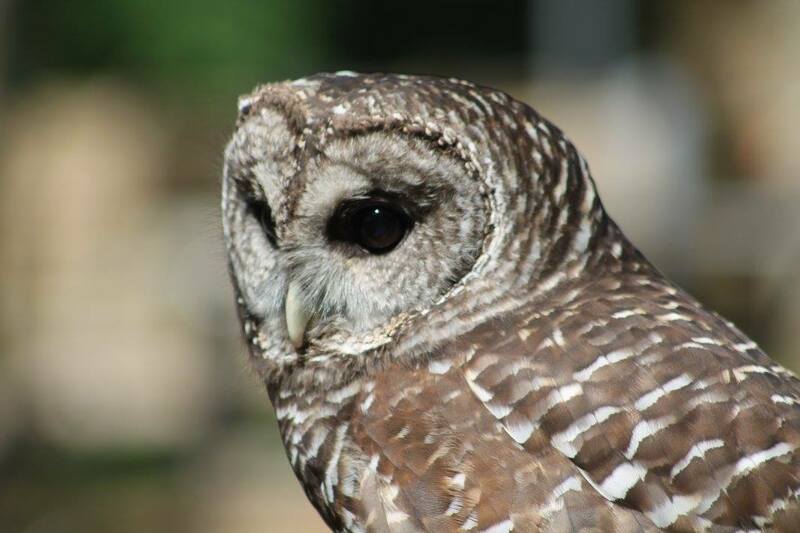 Only a little smaller than the Great Horned Owl, the Barred Owl is markedly less aggressive, and competition with its tough cousin may keep the Barred out of more open woods. Hunts by night or day, perhaps most at dawn and dusk. Seeks prey by watching from perch, also by flying low through forest; may hover before dropping to even hunt clutch prey in talons. 2-3, rarely 4. White. Incubation is mostly or entirely by female, about 28-33 days; male brings food to incubating female. Young: Female may remain with young much of time at first, while male hunts and brings back food for her and for young. Age of young at first flight about 6 weeks. Female may remain with young much of time at first, while male hunts and brings back food for her and for young. Age of young at first flight about 6 weeks. Mostly small mammals. Eats many mice and other small rodents, also squirrels (including flying squirrels), rabbits, opossums, shrews, other small mammals. Also eats various birds, frogs, salamanders, snakes, lizards, some insects. May take aquatic creatures such as crayfish, crabs, fish. Courtship involves both male and female bobbing and bowing heads, raising wings, and calling while perched close together. Male may feed female in courtship. Members of pair often call in duet. Nest site is in large natural hollow in tree, broken-off snag, or on old nest of hawk, crow, or squirrel. Rarely nests on ground. 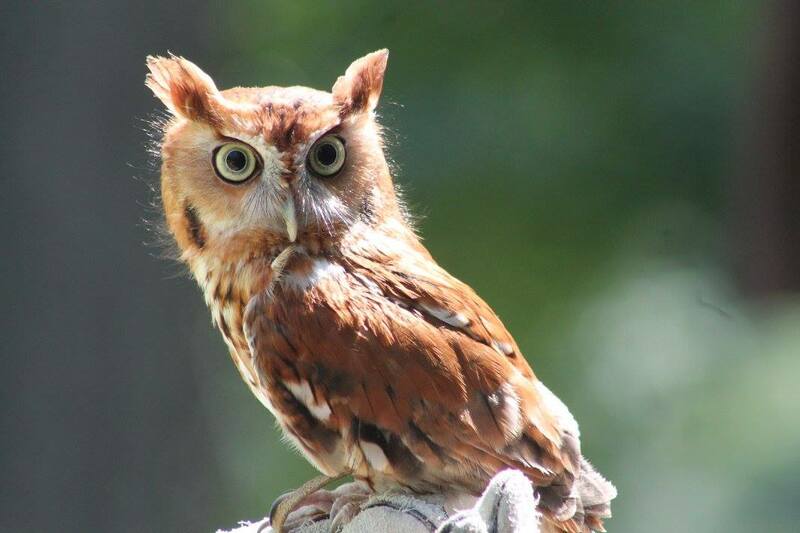 In east, often uses old Red-shouldered Hawk nest; hawk and owl may use same nest in alternate years. Permanent resident throughout its range, although individuals may wander away from nesting habitat in winter. A loud barking hoo, hoo, hoo-hoo; hoo, hoo; hoo, hooo-aw! and a variety of other barking calls and screams. There call also sounds like they are saying “who cooks for you, who cooks for you all”. Go ahead and try it, you know you want to! In recent decades, has declined slightly in some regions, drastically in others. Numbers are apparently stable or increasing in a few sites. May be helped in some areas by provision of nest boxes. Habitat Woodlands, groves, farms, barns, towns, cliffs. Typically in open or semi-open country in lowlands. May nest in forest or city if nearby area has good open foraging territory, such as farmland, marsh, prairie, desert. With its ghostly appearance, rasping shrieks, and habit of roosting in such places as church belfries, this bird has attracted much superstition. However, it is really a good omen for farmers who find it in their barns, for it preys chiefly on mice and rats. 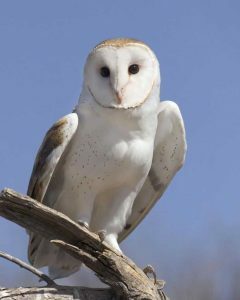 Discovered in its daytime retreat, the Barn Owl bobs its head and weaves back and forth, peering at the intruder. At night it is often heard calling as it flies high over farmland or marshes. One of the most widespread of all landbirds, found on six continents and many islands. Hunts at night, seldom by day. Seeks prey mostly by flying low over open ground, watching and listening; sometimes hunts by flying down from a perch. 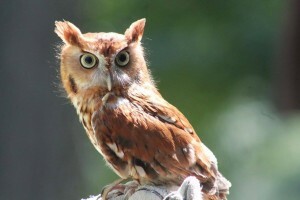 Has excellent vision in low light levels, and hearing is so precise that it can strike prey in total darkness. Usually 3-8, sometimes 2-12 or even more. Whitish, sometimes becoming nest-stained. Incubation is by female only, 29-34 days; male brings food to female during incubation. Young: Female remains with young at first and broods them while they are small; male brings food, female feeds it to young. After about 2 weeks, female hunts also. Age of young at first flight roughly 55-65 days. Young return to sleep at nest or nearby for several more weeks. 1-2 broods per year, sometimes 3. Female remains with young at first and broods them while they are small; male brings food, female feeds it to young. After about 2 weeks, female hunts also. Age of young at first flight roughly 55-65 days. Young return to sleep at nest or nearby for several more weeks. 1-2 broods per year, sometimes 3. Mostly rodents. Feeds heavily on voles; also takes various kinds of mice, small rats, shrews, young rabbits, other mammals. Eats very small numbers of birds, lizards, insects, rarely frogs or even fish. In courtship, male performs display flight, including loud wing-claps; male feeds female. Nest: Uses sites in caves and hollow trees, also many artificial sites such as barn lofts, church steeples, abandoned houses, dry wells, crevices under bridges, nest boxes. Where no existing cavities available, will dig holes in dirt banks. No real nest built, but will arrange debris into crude depression. Some remain all winter near northern edges of range, but some (perhaps especially young birds) move long distances southward in fall. A regular October migrant at Cape May, New Jersey. Hissing notes, screams, guttural grunts, and bill snapping. Young give rapid grackle-like clicks. Counts of migrants suggest declining numbers in the northeast in recent years, but numbers elsewhere still healthy. Providing of nest boxes has helped populations in some areas. Habitat Open country, farmland, cities, wood edges. Inhabits any kind of open or semi-open situation, from forest clearings to farmland to desert, wherever it can find adequate prey and some raised perches. In breeding season, may be limited to habitats that also provide appropriate nesting sites. In winter, females may tend to be found in more open habitats than males. 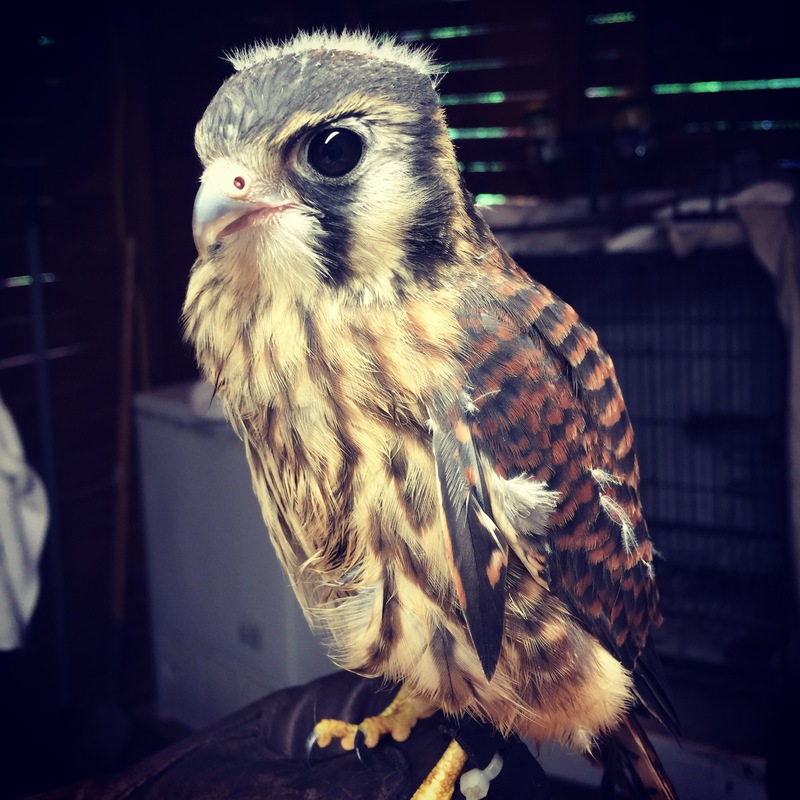 Our smallest falcon, the kestrel is also the most familiar and widespread in North America. In open country it is commonly seen perched on roadside wires, or hovering low over a field on rapidly beating wings, waiting to pounce on a grasshopper. 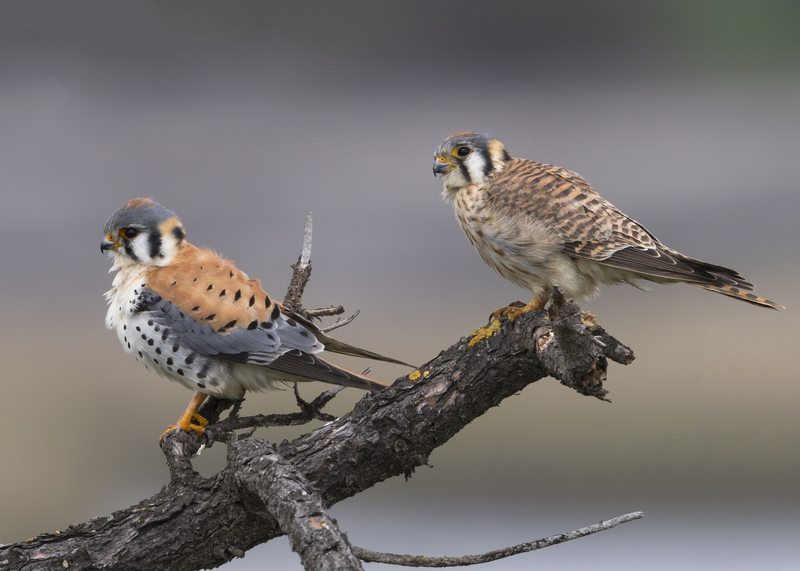 Kestrels nest in cavities in trees; in places where there are few large dead snags to provide nest sites, they may rely on nesting boxes put up for them by conservationists. 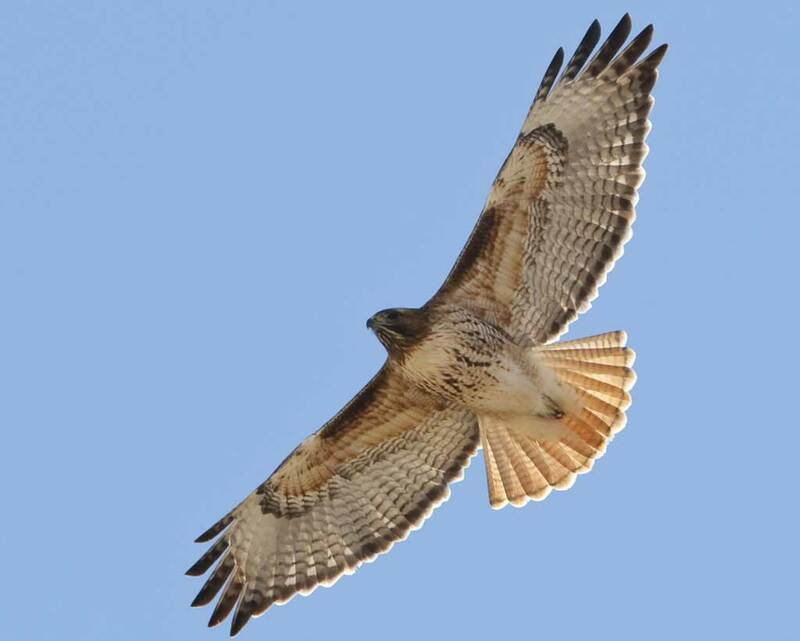 Hunts mostly by watching from a high perch, then swooping down to capture prey. Sometimes, especially when no good perch available, hovers over fields to watch for prey. May pursue and catch insects, birds, or bats in flight. Individual kestrels often specialize on one particular kind of prey. 4-6, rarely 2-7. White to pale brown, usually spotted with brown and gray. Incubation is by both parents, usually 28-31 days. Young: Female remains with young most of time at first, while male brings food; after 1-2 weeks, female hunts also. Age of young at first flight about 28-31 days. Parents continue to feed young up to 12 days after fledging; later, these juveniles may gather in groups with young from other nests. Female remains with young most of time at first, while male brings food; after 1-2 weeks, female hunts also. Age of young at first flight about 28-31 days. Parents continue to feed young up to 12 days after fledging; later, these juveniles may gather in groups with young from other nests. Mostly large insects; also some small mammals, birds, reptiles. Grasshoppers are among the favored prey, but many other large insects are taken, including beetles, dragonflies, moths, caterpillars, others. Also feeds on mammals (including voles, mice, and sometimes bats), small birds (sometimes up to the size of quail), lizards, frogs, earthworms, spiders, crayfish, other items. During courtship displays, female flies slowly with stiff, fluttering wingbeats, the wings held just below horizontal. Male repeatedly flies high, calling, and then dives. Male brings food for female, passes it to her in flight. Nest site is in cavity, usually in dead tree or snag, sometimes in dirt bank or cliff, or in old magpie nest. In southwest, often in holes in giant cactus. Also uses artificial nest boxes. Sites usually 10-30′ up, but may be at any height. Many kestrels in southern or middle latitudes are permanent residents, while northern birds may migrate far to the south. Young birds may tend to migrate farther than adults. Forests, woodlots, streamsides, open country. Found in practically all habitats in North America, from swamps to deserts to northern coniferous forest near treeline. In breeding season avoids tundra and unbroken grassland, since it requires some trees or heavy brush for cover. 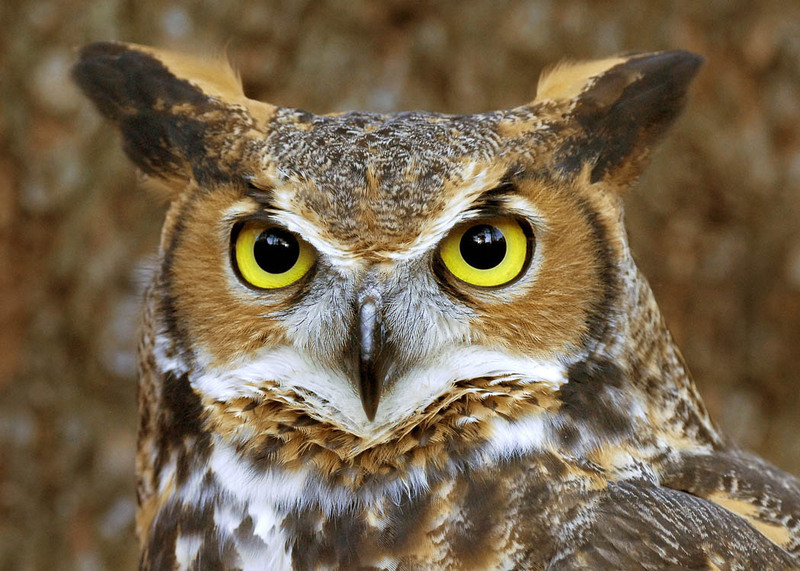 Found almost throughout North America and much of South America is this big owl. Aggressive and powerful in its hunting (sometimes known by nicknames such as “tiger owl”), it takes prey as varied as rabbits, hawks, snakes, and even skunks, and will even attack porcupines, often with fatal results for both prey and predator. 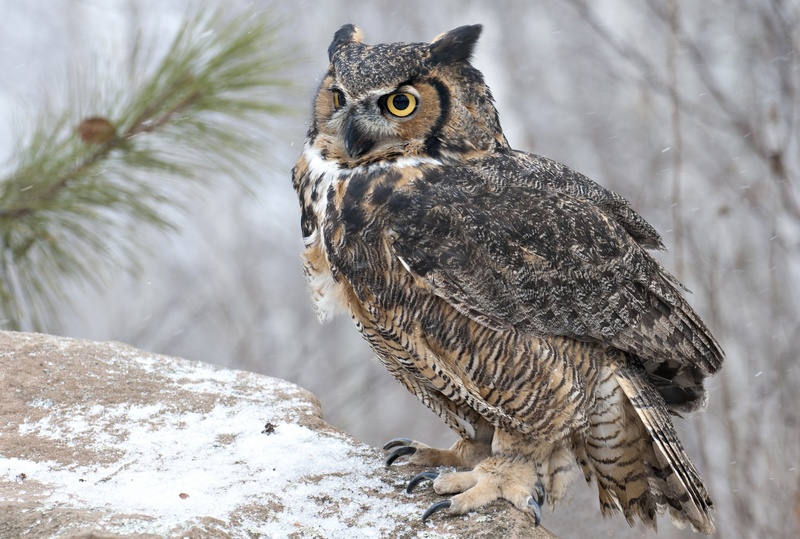 Great Horned Owls begin nesting very early in the north, and their deep hoots may be heard rolling across the forest on mid-winter nights. Hunts mostly at night, sometimes at dusk. Watches from high perch, then swoops down to capture prey in its talons. Has extremely good hearing and good vision in low light conditions. In north in winter, may store uneaten prey, coming back later to thaw out frozen carcass by “incubating” it. 2-3, sometimes 1-5, rarely 6. Dull whitish. Incubation mostly by female, 28-35 days. Young: Both parents take part in providing food for young owls. Young may leave nest and climb on nearby branches at 5 weeks, can fly at about 9-10 weeks; tended and fed by parents for up to several months. Both parents take part in providing food for young owls. Young may leave nest and climb on nearby branches at 5 weeks, can fly at about 9-10 weeks; tended and fed by parents for up to several months. Varied, mostly mammals and birds. Mammals make up majority of diet in most regions. Takes many rats, mice, and rabbits, also ground squirrels, opossums, skunks, many others. 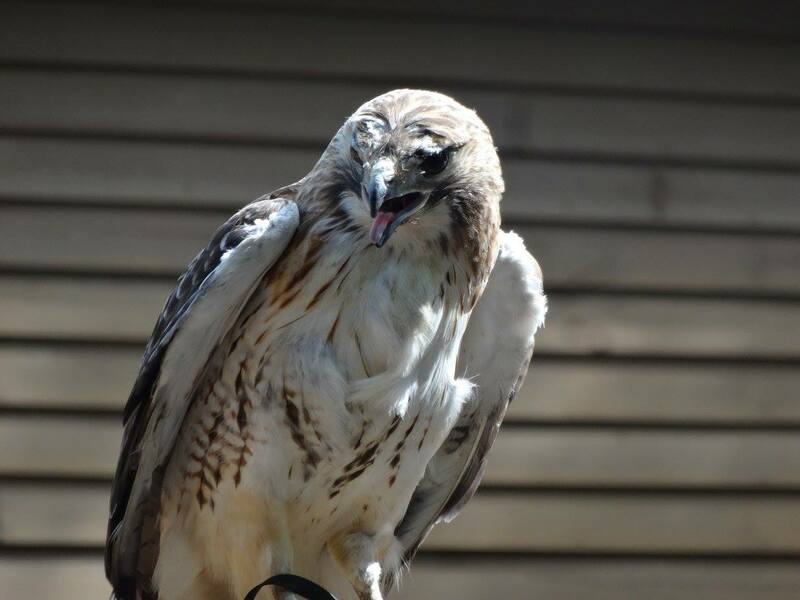 Eats some birds (especially in north), up to size of geese, ducks, hawks, and smaller owls. Also eats snakes, lizards, frogs, insects, scorpions, rarely fish. May begin nesting very early in north (late winter), possibly so that young will have time to learn hunting skills before next winter begins. In courtship, male performs display flight, also feeds female. Nest: Typically uses old nest of other large bird, such as hawk, eagle, crow, heron, usually 20-60′ above ground; also may nest on cliff ledge, in cave, in broken-off tree stump, sometimes on ground. Adds little or no nest material, aside from feathers at times. No regular migration, but individuals may wander long distances in fall and winter, some of them moving southward. Series of low, sonorous, far-carrying hoots, hoo, hoo-hoo, hoo, hoo, with second and third notes shorter than the others.